If you want to be ready for the upcoming weather condition, you should know and understand the different cloud forms. Consider Towering Cumulus Clouds. These clouds can show beautiful opaque rays when the atmosphere is slightly gloomy which distributes the sunlight very well. But how did towering cumulus clouds come to be? What kind of weather do they bring? 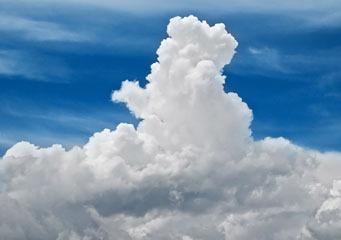 Towering cumulus clouds pertain to cumulus clouds that show extensive vertical development and are noted for having cauliflower-shaped tops with the absence of the anvil feature. However, these clouds could further develop into gigantic cumulonimbus clouds. Towering cumulus is the transitional stage between cumulus mediocris and thunderstorm cumulonimbus cloud. At What Height is Towering Cumulus Clouds Found? Towering cumulus is classified under clouds with vertical development. Therefore, it can develop from low to high altitudes, which is anywhere between 2,000 feet and 20,000 feet from the Earth’s surface. Due to the strong convection associated with the formation of towering cumulus, turbulence within the cloud levels should be expected causing bumpy rides for airplane passengers. However, these clouds do not present any serious threat to aircraft safety. Aside from turbulence, they also produce moderate to heavy rain showers only. Cumulus Congestus is the most common form of towering cumulus and exhibits extensive vertical development and sharp outlines. Strong updraft gives rise to the formation of this cloud type which is generally taller what with cloud tops reaching over 20,000 feet from the ground. With enough instability, Cumulus Congestus could further grow into the cumulonimbus type. This variety of towering cumulus cloud is characterized by having multiple castle-like projections on its summit which is a strong indication of the vertical movement of air. Cumulus castellanus is a good marker of forthcoming rain showers and thunderstorms. Turkey Tower refers to the thin and distinct towering cumulus cloud that develops and abruptly falls apart. Its sudden development indicates that the capping inversion is weakening or breaking. How do Towering Cumulus Clouds Form? Towering cumulus clouds develop due to atmospheric convection and instability. Convection refers to the rise and fall of air in the atmosphere. It is the process in which the warm air rises and the cool air sinks. The atmosphere is said to be unstable when the rising air is warmer than the air around it and therefore rises further. As warm and humid air rises on to the unstable air layer, it is cooled and eventually condenses into water droplets forming towering cumulus clouds. If the surrounding air becomes more unstable and coupled with a very strong updraft, towering cumulus may metamorphose into a thunderstorm cloud. What does a Towering Cumulus Look Like? As the name suggests, towering cumulus clouds have bulging tops that appear like a cauliflower. They have flat cloud base and sharp outlines, with colors ranging from white to light gray. With its intense vertical development, the cauliflower top may become fibrous and smooth, hence, marking the transformation into the thunderstorm cumulonimbus cloud. How common are Towering Cumulus Clouds? Towering cumulus clouds can be seen all over the world most especially in areas where severe thunderstorms frequently develop, such as in the Central Plains of the United States. The presence of towering cumulus clouds is a strong indication of a brewing severe thunderstorm which may likewise give birth to tornadoes. These clouds are capable of producing heavy rainfall and snowfalls. On the other hand, this cloud formation rarely occurs in Antarctica. Despite being slightly ominous, towering cumulus clouds are quite nice to behold. However, whenever you see these on the sky, better be prepared as they indicate a looming thunderstorm.